Thalassemia is one of the world's largest single genetic disease, especially common in the Mediterranean coastal countries, Southeast Asia and southern China. In high-risk areas of southern China, the crowded carrying rate ranges from 1-23%, Guangxi’s morbidity can reach 20%. 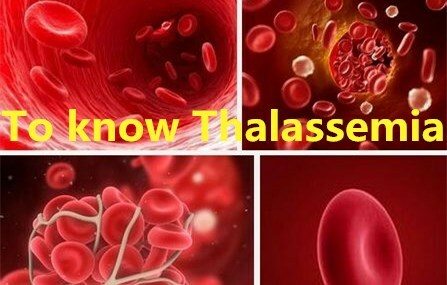 Thalassemia is a latent inherited disease, if parents are gene-carriers of Thalassemia, their children have a quarter prevalence rate and a half rate of gene-carrier. As genetic defects lead to different peptides synthesis(αβγδ) disorder, Thalassemia is usually devided into four types: α、β、δβ and δ，among them β and α are the most common. Clinically, the Thalassemia is divided into three grades: light, medium and heavy. Normal: Four genes in total（αα/αα）. HbH disease： 3 genes deletion(--/αα）. HbBart's Fetal edema syndrome ：All 4 genes deletion(--/--）. β-thalassemia is mostly due to β memory point mutation。Some point mutations make beta chain completely unable to generate, which is called β0 thalassemia; some mutations only cause the beta chain to be lessen and called β+ thalassemia. Usually poor performance of the MCV decline, RBC brittleness decreased, β-thalassemia HbF increased and so on. Laboratory tests include blood test (high sensitivity, low specificity)，Erythrocyte brittleness (subjective), hemoglobin electrophoresis (specific for β-thalassemia than α thalassemia). Diagnosis needs genetic testing, the most commonly used in clinic is α thalassemia(Gap PCR) and β thalassemia (PCR-RDB). 1)MCV <80fl or MCH <27pg, it is highly suspected to be thalassemia. 2)Erythrocyte osmotic fragility test positive (ROFT <0.6): can be suspected for thalassemia. 3)HbA2 <2.5%, is highly suspected to be α thalassemia gene carriers; ξ positive for the standard α thalassemia. 4)HbA2> 3.5%, then β-thalassemia gene carriers. The current treatment of thalassemia is mainly regular blood transfusion, regular iron removal, (serum ferritin greater than 800-1000μg / L), the cost is high, bone marrow transplantation, around 4.5-6 million dollar.